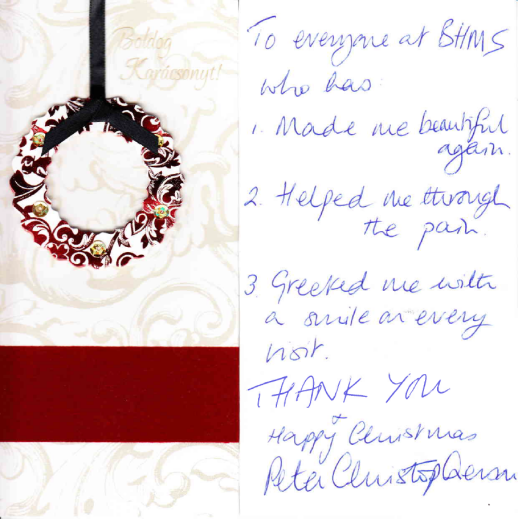 Just a short message to thank you and the rest of the BHMS team for all your help during my recent trip to Budapest for dental treatment. 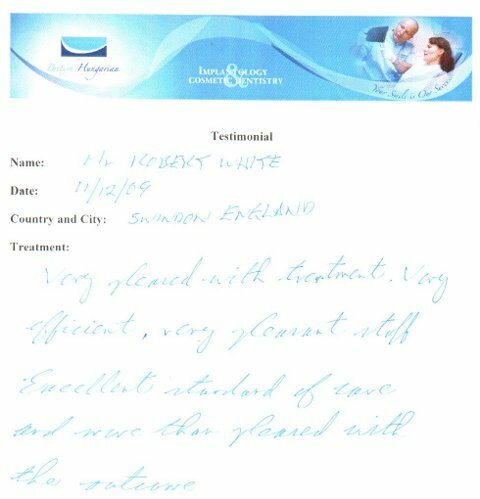 Everything was handled very professionally which made the visit go very smoothly and the actual treatment was of a very high standard. seeing you again in a few months time. let me thank you and Dr. Krisztina Zoltán especially for a wonderful job. I know I can be a trying and at times neurotic patient. I'm very happy with the results and treatment. I shall be recommending you to my friends, relatives and colleagues. It has been excellent from day one in Battersea. By the way thank Krisztina for the Kertem bar in the middle of the park. A great bar to wile away an afternoon in the sun, with some great beer, a good book and people watching. I cannot thank you enough, I have my teeth back! Having just spent a glorious week in Budapest. Many thanks for a pain and stress free experience! My two front teeth are both currently long term temporary crowns and I had the left one replaced recently at your clinic. When doing so I had the opportunity to discuss my longer term cosmetic requirements with Dr's Gyovai and Zoltan. I had been advised by other dentists that the only way to achieve the proportions I require for my teeth would be with veneers, orthodontics and further gum surgery (I have already had gum surgery once) as well as whitening. Contrary to this, I was informed at your clinic that I am unsuitable for orthodontic treatment and was advised against gum surgery. I was, however, told that the shape I desire for my front teeth may actually be achieved by the lab technician when he produces the permanent crowns. First of all I wish to express my gratitude for this good advice which is likely to save me a lot of headache and risk. I am so happy with the standard of care that I will be recommending your clinic to all of my friends and family from now on, including my father who needs extensive implant work in the future. 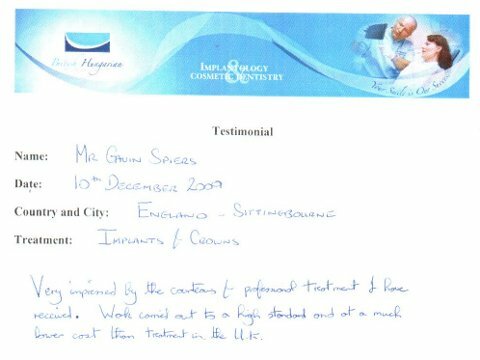 I have seen many, many UK dentists but Dr Gyovai was so professional and attentive that I will be requesting him for all future work and I hope never to use another dentist as long as he is in the UK, his care, professionalism and integrity stand head and shoulders above that of any private British dentist that I have visited. Whilst I am saving money by being advised against unnecessary work, I can assure you that due to the trust and confidence inspired by Dr Gyovai, you have gained a lifelong customer and advocate for your business. Although I have had just one single temporary crown replaced so far I have been treated with the same care and perfectionism as if I were your very best customer. Dr Zoltan was also excellent and was committed to ensuring my happiness before I left the building. Your prices, even in London, represent excellent value for money- as having visited many dentists I can tell that the methods at your clinic are more robust and thorough than those that I have previously experienced- not just at the NHS dentist, but at the private dentists as well. A Happy New Year to you and all your colleagues. Following my recent treatment in Budapest you and your associates may be interested or amused by my experience back in October. I was in Budapest for 12 days for the final stages of my treatment (implant-retained partial denture). As I am sure you are aware, travel on the metro and all public transport in Budapest is free if you are an EU national and aged 65 or over. Whilst I was there I used the metro every day. The entrances and exits are manned by groups of forbidding-looking ticket inspectors. Not once was I challenged on the first 11 days. However, on the 12th. day, equipped with my new teeth, as soon as I entered the metro station 'Opera', a gruff voice demanded: 'Ticket!'. I produced my passport as evidence of my entitlement of free transport and he said 'OK'. The conclusion to be drawn is that up until then I had looked my age but with my new teeth I was apparently much younger. Many thanks for my new-found youth! Please thank Dr. Toth once again, for her dedication in getting my crowns an absolutely 'spot on' colour. I am SO pleased with them! I feel so fortunate to have had Dr. Toth as my dentist. I cannot speak too highly of her. My recent trip to Budapest went very well and Drs Balasz and Govai seemed happy with the Phase 1 of my treatment. I had three implants fitted with a sinus lift in one case, but I didn’t need a bone graft, so it was relatively straightforward. Once I’d had the anaesthetic the treatment wasn’t painful at all and I was kept informed throughout the process. Everyone at the clinic was friendly and professional and I thought everything ran very smoothly. I even managed to return to London before the snow affected the transport systems (although there was a tube strike on the evening I got back)! The Opera Garden was a great choice of hotel. The location was good and the facilities were excellent for the price. Although I was taking it easy after the surgery, I enjoyed some interesting walks around the city and managed to take a few photographs and see an exhibition at the Museum Fine Art. Thanks again to you and everyone involved in London and Budapest. From my point of view, it's so far, so good! 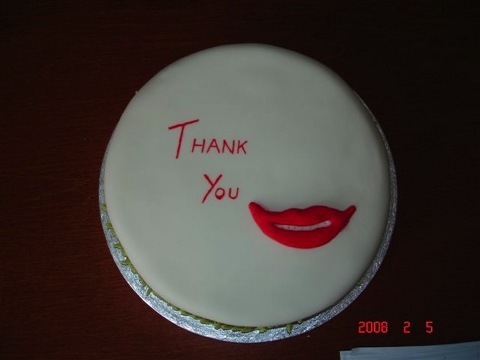 I just had to write and thank everyone at your wonderful surgery for the way you treated me. You could not have been kinder or more helpful and, although a little nervous at first, I felt quite at home with you all in Budapest. A really special thanks to Dr Tóth for her magnificant work-she really is a clever and slillful lady and made such a difference to me. All my friends and customers say what a superb job she did. If anyone is considering treatment with you and would like to talk to someone, please fel free to give them my name for reference-it's the least I can do. I hope to viist again son and have my lower teeth crowned, but in the menatime, thank you so much again. 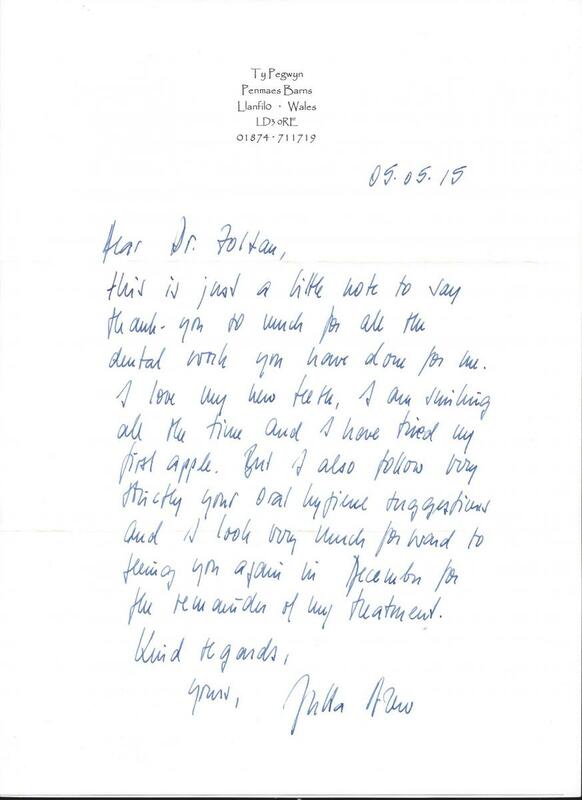 A brief email to thank Dr Gyovai for the brilliant work he did on the implants. I have had no problems at all following completion of the work, they feel comfortable and natural. I am so glad I got it done - I felt like a freak with the large denture beforehand. My wife asked in the taxi to the airport would I go through it all again and unhesitantly my answer was yes. You can tell him he changes people's lives, does he appreciate how much I wonder? Again many thanks to him. My neighbour's sister (I think she lives in Germany) may have arranged an appointment with your clinic following my recommendation. I had no infection in the filling (upper right) which my dentist has looked at. 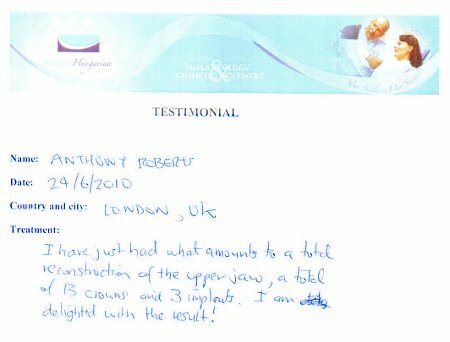 By the way he was most impressed with the quality of the implants and the work. I will be back to the clinic next year for the checkup but will wait until maybe May/June when the weather is warmer (so cold in March) and Budapest is a bit more lively. I continue to be very pleased with my new teeth. My friends have commented on how lovely they are and how they have changed the structure of my face. My sister-in-law is very interested. I gave her one of my appointment cards with your telephone number and address. She intends making contact with you. Have you cards that I could distribute to people. If so, please send them to me. Look forward to seeing you in June 2010. I hope to have my teeth cleaned in London. Thank you to you all for your care and attention. Wishing you all well." With kind regards, Maura M.
"I am fine thank you. I was bad the first day, but that was just drowsiness due to the anaesthetic. I had 2 pain killers the first day and then stopped taking them as I didn't really have any pain. The services provided by the clinic were exceptional. I had the surgery completed on Monday and on Tuesday I went to the schechnyi (sorry about the spelling) pool and also matthias's church and the fishermans bastion. Wednesday I had a tattoo and did some shopping. I spent Thursday and Friday eating goulash, drinking the local wine and watching the very beautiful Hungarian girls walking past the bar. I have no complaints whatsoever and could not have wished for a better service. Also I would like to thank you for the guide book you arranged it was invaluable." We were really impressed by everything - the apartment was good, the dental surgery was excellent, and all the transport was waiting for us each time we went out of the apartment, so even better than on time! Everyone was so kind and helpful - thank you very much for sorting everything out. This is just to say that the implant treatment went really well. It was just one day of discomfort and a couple of days taking it easy(ish) and then I felt fine. The apartment was lovely with a very comfortable bed and we would be delighted to stay there again. Well, once again thank you, Elvira, for your help and encouragement. We were very impressed with the surgery. The consultation at the clinic was fine, very informative, and the people who transported us were all really friendly and made us feel very welcome. We also enjoyed visiting the city. Thanks especially to you for being available on the phone even late in the evening. Everything is fine with my teeth and I am very pleased with all of the work done. I did personally thank the dentists and all of the staff and completed a questionnaire of my experiences. I would be more than happy to act as a reference point if needed. Indeed - I have just completed stage 2 of my treatment. I am on the opinion that your team works to a very high standard, are very caring and considers the needs of their patients. Given that most of us are visiting from England and are we are made to feel very welcome and safe which is obviously very important. My Sutures were stubborn, refusing to dissolve (I'm sure that was what was supposed to have happened). My colleague took them out for me last week as every thing looked fine. My colleagues and I were impressed (we're a very close team of mental health nurses and they all needed to look) what a neat job Dr Bartofi has performed. After my treatment 7.05.07 Andrea contacted me regularly to check if I was okay. She told me that if I had a problem to contact her. I did not require this but felt that I would have been given that support if needed I would like to thank your staff that Taxi me around during my stay in Budapest. It is nice to see pleasant familiar faces when you arrive. And now for Budapest. The last place on earth I thought I would visit. I hadn't really heard of it. What a fantastic Place. During this visit I had chance to explore a very small section of the city. Isn't it beautiful? I'm Hoping that when I retire from work in a few years time I will return for a closer inspection of Budapest, I think I would prefer to live there as opposed to here. (Why you live in England is beyond me) May I just add that on this visit to Budapest I met a lovely Hungarian Gentleman who had worked for so many years in a hospital (where I have also worked) 12 miles from my home here in England. Wow what a coincidence! I have now met 7 English people who are clients of Dentist Abroad. They have all from different parts of England and all at varying stages of treatment. This is always good because I don't know about your people but we will complain about everything. However I spent most of my evenings in the hotel lounge singing your phrases along with them. You asked about improvements to your customer service. I've been very impressed with the whole service and cannot think where you could improve. You have all been great so far. I have recommended you to my colleagues most of which have said that if they required extensive dental treatment they would consider looking to a service such as yours. Finally! A big KÖSZÖNÖM! (THX.) to all of you for everything so far. I can't fault the standard of treatment and care that I received whilst in Budapest and my choice to stay at the Danubius Thermal Spa Hotel proved to be a good one. I spoke to Mr Dave Baker who lives locally who had just returned prior to my visit and he reassured that I was going to be ok and that he had his Exam at the Danubius Thermal Spa Hotel and had follow up treatment somewhere in Budapest. I don't know if he had treatment through your clinic but he will be returning end of September with his wife who is also having treatment. If he was a one of your patients and you were able to syncronise the treatment dates it would be nice to have someone to travel with or talk too. I am glad to report that I am recovering well and am still following the after treatment advice that was given to me, although resting and taking things easy seems so difficult to do sometimes. As you are aware my four month healing period will take to the end of September before I can return to continue my treatment and I would like to know what dates you have available around this time? I also decided to have the healing screws done in Harley Street two weeks before my return to Budapest so depending on what dates you have for the above can you arrange this as well please? I was planning to write to you soon but have been very busy since going to Budapest and haven't had a chance until now. I must say, I am very thrilled with my new teeth. I am so used to them already that I forget that they have only been mine for a week! 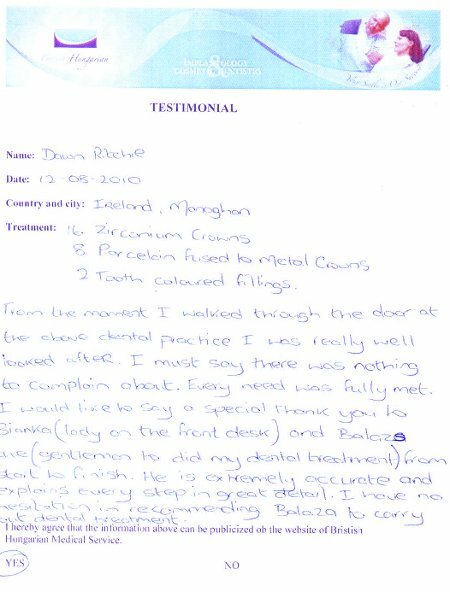 Looking back over my treatment, I have been very impressed indeed by Dentist Abroad. Your company has given me the chance to have treatment which I simply could not have afforded in the U.K. I was a little nervous about having the treatment because of very strong advice from my own dentist against having it carried out in Eastern Europe. However, the fact that you have a base and a clinic in the U.K., and seeing the high standard of your dentists , the surgery and their equipment, gave me confidence. Any concerns I had were quickly attended to by you, and were quickly explained and resolved. I was very impressed by the friendliness and helpfulness of Andrea, the other office staff and the drivers. Andrea seems so busy and efficient, and speaks English better than most English people, yet also made time to smile and have a friendly word and put us patients at our ease. 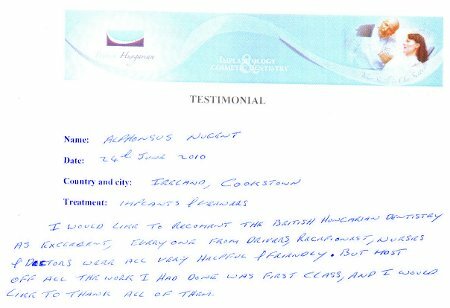 Your drivers were always present on time to pick us up at the airport or at our accommodation, and we particularly enjoyed being driven by Adam who is excellent company during the journeys. 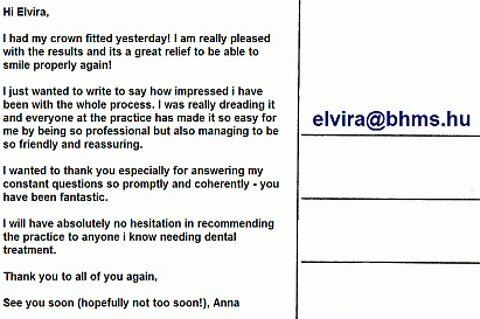 We were also impressed by Ildiko who gave much valuable oral and written advice about recovery and oral hygiene after the initial treatment. With regard to the overall service, we valued extremely highly being transported between the airport, the accommodation and the surgery. It is so reassuring to know that this aspect is taken care of when arriving in a country for the first time with no knowledge of the language, and with one's mind on the forthcoming surgery. Similarly, the arrangement with the Danubius Hotel was excellent. We loved staying there and couldn't think of a more pleasant place to stay for the first time, especially set, as it was, on Margit Island. We also loved our apartment in Kiraly Ut. It was modern, clean and comfortable and well placed for being able to walk to most of Budapest's sights, the metro, the shops and especially the excellent restaurants in Liszt Ferenc Ter. As you know, there were some problems with communication regarding the treatment and the number of visits required. The initial treatment plan I had been given before the first visit was that the treatment would be carried out during two 5 day visits. The first visit was for the implants (which we understood would have healing screws inserted) and impressions, and, 5 days later, I would be fitted with a temporary denture. The second visit was for impressions and, 5 days later, fitting of the crowns. After my treatment during my first visit I was, again, told verbally and given a treatment plan both of which stated that I only needed to return for a second 5 day visit to complete the treatment. There was no mention of an additional one day visit to have healing screws fitted. If the mistake with the treatment plan had not happened, and if I had been told what might happen if I delayed returning for the next session of treatment, things would have been perfect, but these problems should not detract from the fact that, overall, I am exceptionally satisfied with the treatment and with the arrangements by Dentist Abroad, and I'm very very happy with my teeth. I'm also delighted that the experience has introduced us to Budapest, which we enjoyed visiting so much that we are already planning a return visit next year. My thanks to you personally, and to Viktoria, for all your attention, help and advice over the last year. I was going to contact you in the next few days to let you know how I got on but you beat me to it!!!! Well I am back with 7 implants, 2 Bridges of 3 teeth and 3 crowns. Having had no teeth in these positions for the last 15-20 years I am slowly getting used to them being in my mouth and actually using them. From first contacting you last year and 4 trips to Budapest, to have reached this point has been quite amazing. Firstly you Timea who is my UK contact. You took control of the situation from me sending you my panorex x-ray to organising my treatment plan, appointments, airport and hotel pickups, and accommodation in Budapest. Your recommendation of accommodation was fantastic. It made our stay in Budapest all the better. Your efficiency has been absolutely first class and superb. My implant surgery and sinus lift by Dr Bela Bartorfi and his superb assistants went fantastically well bearing in mind my nervousness!!!!!!!!! My 3 follow up appointments were just as amazing. The airport and hotel pickups, the accommodation and the appointments have all been carried out superbly and efficiently. Now for Dr. Balazs Gyovai who carried out all the necessary restorative work after the surgery. His patience and that of his assistants was absolutely fantastic. He made sure that I was always OK, and that the abutements and impressions were exactly as they should be. I have no hesitation in recommending you and your organisation. I also offer if you require personal recommendation to please let any future patients contact me and I will tell them of my experience. Thank you for giving me this opportunity to comment on my experiences during my three visits to Hungary. Personally I was treated by all your staff in a fantastic, friendly and professional manner. The work carried out was first class and to be honest, better than I expected. Apart from the obvious bouts of discomfort that come with major dental treatment, it all proceeded like clockwork. 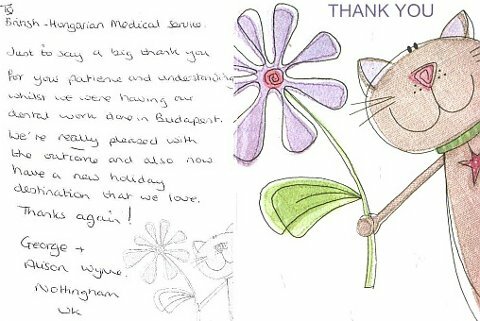 A testament to the hard work all the staff in Hungary put into making the patient their number one priority. I was pleased with all aspects of the work right down to the pleasant transfers to and from the airport. One point that I should mention, not that it was a problem to me, just a comment that may help. The relaxed dressed down attire/dress that is worn by the administration staff gives an impression that the service supplied may not be as professional is it obviously is. I think most of the British patients have a expectancy to see nurses (in whites) attending them at reception. This to me did not effect the total professionalism of the team. In fact it made me more relaxed about my treatment. Thank you again for giving me back my smile and confidence. WOW! Lovely to hear from you. The service I received at your clinic was superb. The staff were friendly & professional you were so right about them making us welcome. I thought I would die from fear & I could not even hold the paper cup of water I was shaking so much, but the Dentist understood & he made sure I was pain free & kept me informed as he went along with all the procedures. He was absolutely fantastic. The pick ups from the Airport & Hotel is such a good idea, it takes a lot of the worry out of travelling abroad & being late & not knowing where to go, I may even make the next trip alone, as this trip went so well. Your E Mail telling us all about Hungary was such a good help & made us feel really cared for. The hotel was very nice and understood I needed ice for a pack, to keep the swelling down, the bartender brought a few glasses full of ice to the room, without even a question or a charge. Wonderful service. My only thoughts would be to tell patients if they are undergoing implants, is to take with them, some camomile tea & some calcium tablets as these are part of the first 7 days recommendations & it would be easier to take along with you, rather than go out to find them if you have a swollen face. I have recommend you & your clinic to four people at work already & they will contact you, so that must tell you that I am a pleased & happy patient. I can't wait until my next trip to get my "real " teeth and take out this horrid plate, but I know it will be worth while in the end. If I can help put any ones mind at rest before they make the trip, I will be very pleased to talk to them. Many thanks Timea, you were the start of really professional , kind & understanding service. Just wanted to let you know how well my visit to the clinic went. 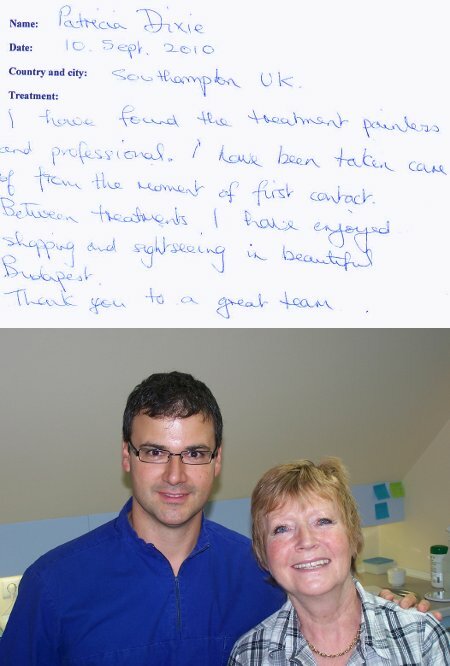 Dr Batorfi was really kind and put me at ease and I felt really safe in his care. I was very bruised and sore but it was worth it and I am so glad that I went back to the clinic. The service was excellent and the staff were very kind and helpful. Esspecially Maria because I phoned her a few times on the emergency phone number about any worries that I had and she was very nice and reasuring with me and did not mind at all about me ringing her. I would also like to say a big thank you to you for all your help in the last few months and look forward to my visit in 8 months for my new teeth putting in. Will you be contacting me nearer the time to arrange the next visit? Thanks again to all of you and I would definately recommed the clinic to anyone. Ps: I visited my own dentist today and he said it was a really neat job that Dr Batorfi had done and he was very happy with it. I am pleased that you have chosen to include the extracts from my e-mail back in July 06 on your web site under your Patient References section. (...). I thought that it might be of interest to provide you with an update, for the benefit of other people who might be considering reconstructive / cosmetic dental treatment in Hungary and that you might wish to include this e-mail as an 'add on' in your web site as well. I have now completed the full course of treatment and just returned from my 3rd and final visit to Dr Batorfi's Clinic in Budapest last week. Following the four month period that was recommended by Dr Batorfi to allow the implants to fuse to my jaw bone, I returned to Budapest for 2 days to have the healing screws fitted. (from a layman's perspective, this involved placing small titanium attachments into the implants to allow the gum tissue to reform around them). Once again this was a totally straight forward and painless procedure. I returned to the UK for a few days and then flew back to Budapest 8 days later in early November, to have the 3rd and final stage of the treatment completed. (It costs less for a return flight to Budapest via easyJet.com than it cost to park my car at Gatwick for 7 days). On this visit the first appointment was on the Wednesday afternoon, collected by your new driver and driven straight from the airport to the clinic, to have the impressions made for the final 3 crowns, which took about 30 minutes. I then had another 5 days of relaxation at the Danubis Thermal Spa Hotel on Margitsziget Island, which is situated in the middle of the river Danube and the opportunity to explore yet more of the architectural and cultural heritage of the City of Budapest. 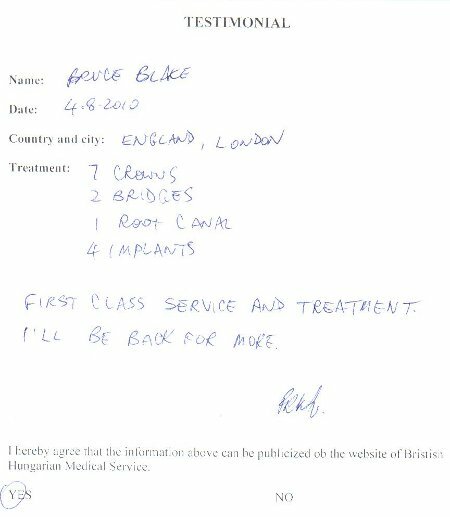 The second appointment was at 7.00pm on the Monday evening when Dr Balazs Kozik fitted the 3 crowns to the implants, which took approximately one hour. He took extraordinary care to ensure that the bite pattern was identical to that when I had my natural teeth, by skilfully sculpting the porcelain crowns to identically match those on the opposite side of my upper & lower jaw. I can categorically assure any prospective future patients of Dr Batorfi, who are viewing this website, that I am not on the payroll of his clinic! The fact is that the standard of treatment and care afforded by his team is OUTSTANDING. I have met many people from the UK & Ireland during my 3 visits to Budapest, some of whom were nervous and apprehensive before the treatment. Thank you for your e-mail regarding your Harley Street consultation facility. * The service and coordination of everything by yourself, from my initial internet enquiry onwards, was superb. (Treatment plan, estimates, hotel bookings, airport transfers etc.) Thank you! From an extremely large age, I have experienced problems with my teeth - the predominant reason being the fact that I have a close bite. This means quite simply (in layman's terminology) that my upper teeth meet my lower head to head. Most people are fortunate in that their upper teeth slightly overlap their lower teeth, or vice-versa. Over the years, and in spite of the best treatment within the National Health Service, my teeth have deteriorated to the extent that I have lost most of my back upper and lower teeth on each side resulting in the necessity of biting and chewing with my front teeth. It became abundantly clear to me that in time, these teeth would also wear out, and being aware that dentures were impossibility due to my close bite - the only remedy would be implant surgery. With this in mind, I made the requisite enquiries and was horrified to discover that the overall cost of the surgery required to replace my teeth with dental implants and crowns, if performed in the UK, would be in the region of 20.000.00GBP!! Being retired and on a fixed income, I considered that sum to be prohibitive, and decided to have a look on the internet with a view to searching for more cost-effective treatment on the European Continent. I would add at this point that my UK dentist fully approved my intentions. I am delighted to say that I found a web site entitled Dentist Abroad.co.uk. Their address and telephone number are - 26A Parkway, London, NW1 7AH. Tel: 02074248957, and their main surgeries are based in Budapest, Hungary. Having made contact, I was furnished with documentation contacting the full repertoire of their services, treatment and costs. Having decided to take the matter further, I was asked to obtain a panoramic X-ray so that Dr. Batorfi, the Principal of this Practice in Budapest, could provide me with an accurate estimate of the treatment required, and six titanium implants, and sixteen crowns (including three bridges). This would necessitate two five or six day visits to Budapest, with a gap of four month between each stage of treatment. (The implants needs time to knit to the jaw bone). I was both pleased and amazed that the estimate amounted to less than one third of my UK quotations - the only extras being the cost of the flights to Hungary and accommodation in that lovely city. This organisation even provide a discounted price for the hotels they offer to their clients, meet you at the airport, transport you to your chosen hotel, and thereafter convey you back and forth between your hotel and surgery, as and when required. On completion of each stage of my treatment, I was transported to the airport for my flight home. To summarize, I have no hesitation in recommending Dr. Batorfi and his excellent staff to any person requiring specialised dental treatment. His clinics are furnished with the latest computerised technology for all forms of density and from the moment you make contact with their London Office, you become aware that you are in very good hands. Nothing is too much trouble. They provide an excellent service from beginning to end, and I can offer nothing but praise for my treatment. Finally, my entire experience has been both rewarding and excellent value for money. As you are aware, I was in Budapest from 11th-16th September for completion of my current course of dental treatment. On this occasion, my wife Vivian accompanied me, and we were very sorry that we were unable to meet you due to your recent operation. I would also like to take this opportunity to commend each and every member of your staff for their kindness, professionalism and efficiency, both here in London and Budapest. I am delighted with the result of your efforts on my behalf, and will quite likely make arrangements to visit you again next year for further treatment to my upper right jaw. In conclusion, my wife joins me in wishing you rapid recovery from your recent operation and best wishes for the future. From the first time that I made contact with dentistabroad.co.uk I was thoroughly impressed with the whole organisation. The initial contact was a phone call to the London office and I found that the office manager was a mine of information. She answered all my questions as fully as I could possibly have hoped. She was always very friendly and helpful and whenever I had a question she never failed to supply an answer. After deciding to go ahead, with the venture of having implants fitted, it was very easy to arrange flights and accommodation. Any difficulties and the London office offered to do it all for me. They would supply a choice of flights and places to stay in Budapest. Having chosen the when and where everything seemed to be so organised. I was met at the airport on arrival and taken to a first class hotel. Appointments were made and transport was provided on every occasion. There was never any waiting as the cars were on time and as soon as I arrived to the surgery I was shown straight in. I must also say that the drivers must have been chosen, not only for their driving skills, but their friendliness and knowledge of Budapest as well. The surgery proved to the model of a modern invention. All of the equipment was at the latest design. It wasn't just for show either as throughout each session the efficiency and expertise, of all the staff was constantly being demonstrated as each machine was in frequent use. I do believe that the computerised system, that was being used, was second to none. Dr Batorfi, from the very first moment, gave the impression of being extremely competent and professional. He always explained, in full detail, what he was going to do and answered any questions with the same thoughtfulness. The treatments themselves were quite surprising as they appeared to pass quite quickly. Even the sessions that were quite long in actual time went so smoothly that it hardly seemed any time had passed before the session was over. During each period of surgery I was also conscious of the staff that was assisting Dr Batorfi and I was certainly aware of what an efficient team they were. Hardly any instructions were needed as each person seemed to know what to do in advance. It certainly gave me the feeling throughout that I was in safe hands. In conclusion I can honestly say that a person would have to search a long time before finding anywhere to compare with Dr Batorfi's clinic. When I also add the fact that the whole treatment cost me only a fraction of the UK price. I am very pleased that I made Dr Batorfi my first choice. I hope this email finds you well and happy and enjoying a beautiful spring in London. I just wanted to write to you and everyone and tell you that my new teeth are a big hit here in the US – despite my massive anxieties when I was in Budapest, everything is better than fine – it is magnificent. And, as I had suspected, it helped me also with my singing – I have never sung better than I sang on the concert I did on 19 March after my return, and I know that having the dental repair has freed my entire muscle structure around the mouth and set me free to sing with greater abandon. Again, thank you so much for everything that you did, and thank everyone for me. Just been back a week now from Budapest and want to go on record to say what wonderful work you all do. When I first explored the possibility of travelling abroad from Ireland to get the Bridgework done , there were a couple of other companies who were getting a lot of name checks in the press and featuring prominently in net searches, but I thank the day I happened upon DentistAbroad .co.uk. From my initial enquiry, Timea dealt with everything in a speedy, efficient manner and nothing appeared to be too much trouble. I passed my sister on to you... and she too marvelled at the quality of service. I was not surprised then when a 'Hungarian whirlwind' picked us up at the airport on a very snowy Sunday night! Ildiko was to be my driver and all-round 'good-thing' for my week long stay. She made light of the weather conditions and got us to our thermal Hotel which was to be home for the week. The hotel was fine, lovely and warm, and most of all wonderful spa facilities, much of it included in the very competitive rate organised by yourselves. My treatment (8 unit bridge) required 3 visits to the clinic, one for 2 hrs, the other two were a matter of minutes. I was ferried to and from by Ildiko and sometimes Zoltan and this really makes a huge difference as the clinic is a long way from the city centre but all the planning and thinking is done for you. These trips were shared by others along the way, a Scotswoman , an English man and most exotically a renowned American Opera singer! We could not have been in better hands. The clinic is State of the art .... Surpassing any I've visited here at home. My work was carried out by Dr Tunde, a lovely lady dentist, who seems to have the ability to reassure and encourage calm in her patients and kept me posted as to what was going on. She speaks English and was even sweet enough to offer some suggestions for the sightseeing itinary! And believe you me I got my share of sightseeing in. I an absolutely delighted with the end result. The wonderful thing is how natural they look, this was something Tunde seemed to have as a real priority and appreciates we don't all want Hollywood smiles! Budapest itself was fabulous.... And maybe looked even better in the Snow. The language of course is impossible but this is not such an issue with DentistAbroad being involved and in Ildiko (again another multilinguist) I had just the woman to give a crash course in Hungarian - or at least help me pronounce "nem sajt" or "no cheese" something you might find useful if like me you have an almost irrational dislike of Cheese! The only downside of my trip was the fact I lost my camera on the last night there. Again Ildiko and Timea were wonderful in the efforts they made on my behalf to recover it. But no happy ending there..... my own fault totally. But perspective has kicked in now - and it was my long awaited bridge I went for and not the photographs. I had a temporary denture for 4 yrs as I wondered WHEN I would ever afford the bridge which would restore some sort of normality. Goodbye Fixadent and Steradent! The Batorfi clinic price was 1/3 of the Irish price and and you'll still save money while visiting this jewel of a city, steeped in history but bursting through into a new Europe. I would not hesitate to recommend the whole package to anyone looking for quality dental work. I heard of two 'less nice' experiences had by others using one of the other Operators I had first come in contact with. However Dr Batorfi rescued those situations as well. My circumstances were that I required 5 implants, which in the UK would cost L9,500 plus the cost of X-rays, dental cleaning etc. I searched the Internet and eventually chose Dr. Batorfi, not for any particular reason other than they had a contact in Camden Town. Prices from Hungary varied slightly, my quote being L3,800 with no additional charges. Once I made contact in the UK via e-mail they were extremely helpful giving a catalogue of information not all available on their web site. Once I settled on a date, they organised the hotel and dentist appointments. I flew with Sky Europe the Hungarian equivalent of Easy Jet from Stanstead the flight costing my wife and I a total of L128 return. I could have used Easy Jet who were similarly priced flying out of Luton. There was no difference regarding service except Sky Europe allocated seating. On arrival at Budapest we found a modernised building with plenty of signs in English. The Taxi driver was immediately apparent and he took us straight to the hotel. This, our return and all the dentist visits were all paid for and all I gave was a 1000 forints tip (L3) each time. The following day we were met by Ildiko Kovacs who spent a great deal of time explaining the agenda whilst we were in Budapest. Ildiko is an essential contact as she dispels many fears you might have and answers all those niggling questions that you have stored in the back of your mind. Journey to the practise was about half an hour and there I found a modern house where the Dentist lived on the ground floor and his surgery on the first. Having been to many dentists in the UK I can assure you this practise had state of the art equipment and their hygiene standards were far better than ours. The treatment took approximately one hour although the total time was about two at the surgery. On completion I was given a course of antibiotics and strong painkillers, which I found I did not need to take. I did have discomfort and soreness to my gums but the actual implants were not a problem. I had to return the following day to have a replacement denture (how long would that have taken in the UK) and then flew out early the following day. Ideally they would have preferred me being in the country a little longer however I had the treatment at 10am on the Tuesday and flew out at 7am on the Thursday. We did decide to stay at the Thermal Hotel Margit Sziget a four star hotel and I think on reflection this was a wise move as having spoken to others some hotels are noisy. This hotel was in a quiet location about two miles from the city centre (Bus 24 was the cheap option in). The food was self-service all labelled in English. My wife had dietary needs, which once explained to the Chef, took her around the food counter pointing out what she could and couldn't eat. No doubt we could have eaten out and cut costs but the peace of mind we had, for us far outweighed this. I return in August for my final treatment, I have saved a considerable amount of money, will have had a holiday and not compromised my teeth one iota. I also met several couples from the UK and Ireland having similar treatment some on different packages, nobody had any complaints about the work they had done. I would recommend before undergoing treatment you use your own dentist to find out exactly what you require and what is and what is not possible. I am more than willing to spend time talking to anyone interested in having similar treatment. Friends of mine are already planning to take up this option for dentistry. I am very pleased to be asked to write something about my experiences at Dr Batorfi's clinic and team. Dr Batorfi offered treatment that I had not been offered in the UK. The cost was approximately 60% less than it would have been, in my particular case L6,000 instead of L16,000. I needed six implants 14 crowns and five inlays which was very extensive treatment. I needed to visit Budapest three times staying in a top-class hotel, arranged by Dr Batorfi at a very good discounted rate, (I checked this for myself). I was met at the airport and always transported to and from the hotel and the clinic. The best comment I can make is that all the gaps in my mouth that I have had to live with for years now have solid teeth and at last I can eat whatever I like. Before I went well-meaning friends and professionals try to dissuade me; "it's a long way away," "how do you know their standards are the same as ours" none of these concerns proved to have any grounds whatsoever. 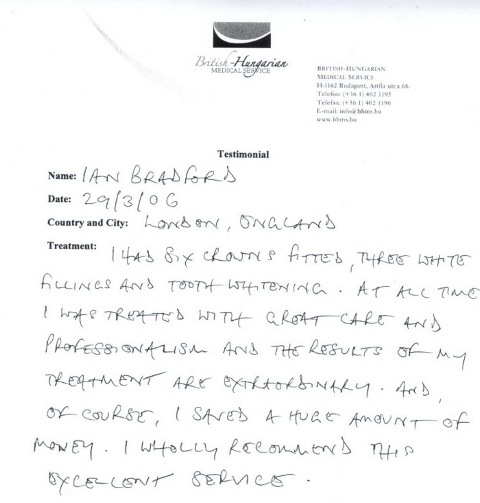 I won't pretend that I didn't have doubt of my own and I certainly did a great one deal of investigation before I made up my mind but having been there and received the treatment I am now happy to confidently recommend Dr Batorfi to anyone who is considering dental treatment and particularly implants. My name is Peter Brennecke I live in Southampton, England. I am 77 years of age. I started having treatment at Dr Batorfi's Dental Practice in February 2005. I had 6 crowns replaced in upper front of mouth and 4 upper implants placed at the same time. I have just returned in August 2005 and had that work completed. I now have a full upper set of teeth. Originally I was going to have a bridge made and fitted for my lower missing teeth Dr Batorfi explained that my bone structure was good and he could make a better job with 4 lower implants. I agreed and have had 4 lower implants placed. I am returning in December 2005 to have these 4 lower implants completed so I will have a full set of teeth for Christmas. It is not a problem going to Hungary the drivers collect you from the airport, take you to the Hotel and take you to and from the surgery, they look after you very well, they are always very reliable and eager to please. At my initial consultation with Dr. Batorfi, everything was explained in great detail. Questions were patiently and clearly answered and any apprehensions I had quickly dissolved. I was told how the treatment would proceed, the timescale and the costs involved. My wife and I were extremely impressed with the skill and professionalism of Dr Batorfi. His office in London and the staff have always been very friendly, helpful and caring. The surgery and equipment are in pristine condition and the most up to date I have ever seen. Also the cleanest and simply the best. Every stage of treatment was meticulously executed - including colour matching of the implants. Thank you so much for giving me a smile to be proud of, I cannot thank you enough. Your manner and patience throughout cannot be faulted. My family cannot believe that my teeth are implants as they look so natural. I would recommend you to anyone who is thinking of having dental implants and I would be more than pleased to show them the work you have done. Once again, thank you. You have made me so happy and given me back my confidence to smile again." Hope you are well. I just wanted to thank you for all the help and advise you gave me during my months of treatment. I have acheived what I thougth was not possible, to have the nearest thing to my own teeth. I am very grateful, not only to yourself but also to Dr Batorfi who without his expertise this would not have been possible. I wondered if you could pass on my thanks to him and also to the lady dentist (whose name unfortunately I cannot remember) who made such a wonderful job of whitening and refilling my bottom teeth. Just a quick note to say thank you very much for the treatment last week. I am so glad I had my implants done by such an experienced and professional dentist like you. Thank you also for the super books you sent with Christian. It was really nice of you. The service you and your partners provide is excellent (great hotel, great driver, great dentistry). I shall certainly be recommending you to others. Tracey Abbott recently underwent treatment in Budapest and was so impressed she decided to write us a short guide from her experiences - thank you Tracey. "...I saved over L2000 getting both necessary and purely cosmetic work done and that included 2 weekends in the lovely city of Budapest (including flights). The car service they run picks you up from the airport and takes you to the heart of Budapest and a luxurious hotel called the Thermal which apart from well appointed large rooms has excellent spa facilities. If you decided to go for any of the treatments which include mud packing and several kinds of massage you will need to book in advance . You need to leave at least 20 minutes prior to your appointments to find the medical centre and register. They work to a strict appointment system and see people every hour on the hour. The pools and spa baths are great and are open from early in the morning till 9pm at night. The breakfast is included in the room price and consists of a well stocked breakfast bar of hot and cold savouries, pastries, fruit and cereals. Its advisable to get to breakfast early as the hotel and room can get very busy after about 8.30. Room service is excellent and the food is cheap. It is very nice to sit out on the balcony and watch the Danube flow past drinking your first coffee of the day. The hotel will take most currency but its better value if you pay in the Hungarian Forint. The exchange rate is very favourable. I used the rough guide to Budapest and found that their choice of cafes and shops was great but the restaurants left a bit to be desired. Great if you want the genuine Hungarian experience but to English tastes a little odd. The public transport system is excellent but its easier to get a Budapest card that allows unlimited travel on metro, trams and trolley cars as fiddling around with the single tickets you can buy can be a little tedious. Budapest is a wonderful city to visit and there is plenty for adults and children alike to keep you busy for 1 or even 2 weeks. On the whole people are very helpful although very little english is spoken. The dentist I saw was Dr Batorfi and he has the most impressive surgery I have ever seen. The whole process was quick, almost painless and extremley efficient. I have never seen anything like it in the UK and I am extremley pleased with the results of the work he has done. For anyone who is looking to save money for work needed and is prepared to travel to do that I cannot recommend this company and dentist highly enough.